A week is a long time in racing. 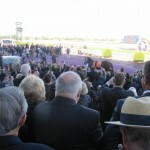 Last week it was all crowds, champagne and Black Caviar. This week it is deserted. The teeming throng – where have they gone? Those of us that are left are wandering around aimlessly. What will we do now? How will we cope? Oh, how we loved her! I busied myself with photography. Look, last week’s litter! I nearly got a good snap of a dangling doodle on Tonyboy in the third, but the angle of the dangle thwarted me in the end. And I was late arriving. Whenever you are late you seem to start behind the eight ball and never recover. And so it proved. Two bets for two losers, Catered in the fillies and You Can Dance in the mares. I haven’t had a losing day for some time so I was flailing about wildly for something or someone to blame. At first I decided it was the gale force northerly wind that wreaked havoc with the horses and my hat. Then I decided it was the dodgy track. The inside was definitely off. Then I thought it was the wide running rail. Until finally, of course, it had to be the blooming jockeys. They were very poor rides. Shockers. And then the wisdom of my motivational adviser kicked in. To deal with disappointment you must first accept that you have made a mistake, then forgive yourself, and then move on. OK. I admit that I was probably in error, I am nearly prepared to forgive myself, maybe, and I am moving on, slowly. Acceptance, forgiveness, move on. Bring on next week. I’m running late, very late, for a funeral. Well, not a funeral, but a farewell. I miss the 12.57 train at Kensington, so I decide to make a walk-jog-run for it to Macaulay station, a good 500 metres. The iPhone says I’ve got 5 minutes. Usain Bolt can do a hundred in 10 seconds, so I should have no trouble with a hundred every minute. Easy peasy. But I’m on the verge of collapse as I cross Moonee Ponds Creek and watch despairingly as the train pulls out of Macaulay. What to do? The funeral starts at 1.55 pm and the next train will be 20 minutes. So I trudge back to Kensington for the 1.17 pm. Sit down, catch my breath, and an announcement. The 1.17 has been cancelled! Next train is 1.37 pm. What to do? In an instant I’m off and make a walk-jog, no way am I running for it, back to Macaulay station. Spare me. Two minutes to spare. A good connection at Flinders Street, an express to Caulfield, and no way am I running ever again. On course seven minutes late and the funeral hasn’t even started. Not a bad crowd. The Reverend Gerard Whateley is doing the eulogy. His voice doesn’t waver as he sings the praises of the soon to be departed. And you can’t leave the pollies out of it. Dennis Napthine waxes lyrical about that big backside. Pete mutters a few words. 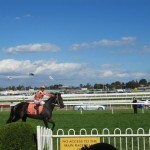 The jockey mounts, parades around to stirring music, and soon it’s all over. To think, all this fuss for a horse. 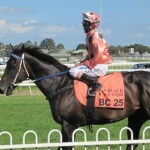 A horse is just a horse, even if it is Black Caviar. The best bit? The stable letting everyone get their hands on history. 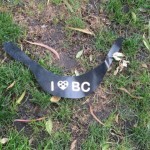 The Stewards must be reading this blog. They were paying a bit more attention to the gear list today. 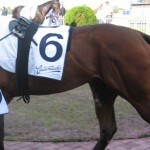 And in the last they were vigilant too: “Co-trainers Mr M Ellerton and Mr S Zahra were fined $50 for presenting Twilighting in the mounting yard with blinkers which are not part of the mare’s declared gear.” I missed that one. You’ve gotta keep your eyes peeled! And in the first Royal Rada had the flowerpot on in the stall. 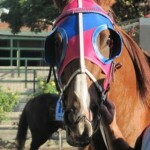 Well, it’s not really a flowerpot, but the first horse I ever saw muzzled was wearing a homemade device made out of a plastic flowerpot and was nicknamed “Flowerpot”. The strapper said Royal Rada was an angry horse and as well as biting humans will even strike out at passing horses with his front legs. 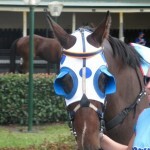 You may remember that good Group 1 horse Weekend Hussler used to wear a flowerpot. His strapper Margaret McDonald apparently still has the scars from his bites! 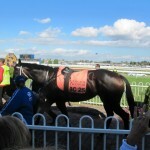 Royal Rada finished eighth. Now that I’m paying more attention to the bridle I keep seeing things that I shouldn’t see. Each raceday there seems to be stuff that doesn’t appear on the official gear list. They are usually fairly minor things, some would say trivial, but it means that I can’t have full confidence in the official list and must still check the horse for myself. Today I noticed two bit lifters (Purple Storm and King Cotton) and a tongue tie (Honey Flower) not on the list. They are probably fairly benign pieces of gear with little impact on performance, but it’s always nice to know. 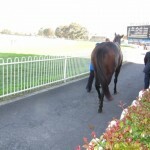 Honey Flower, a beaten favourite, was late into the yard, and early out onto the track. Purple Storm ended up bleeding for a second time and is now rubbed out for life. King Cotton ran last.